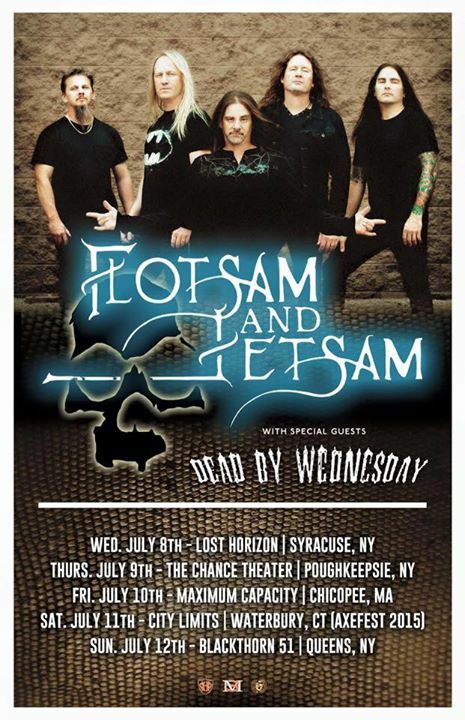 Flotsam and Jetsam announce US East Coast Dates and second leg of 2015 European Tour. Fresh off of their recent “No Place On Tour 2015” EU run, the legendary Flotsam & Jetsam will headline a string of Northeastern U.S. dates! Five of these dates, July 8-12, will feature direct support from their friends, Connecticut natives DEAD BY WEDNESDAY . The mini run begins at Lost Horizon in Syracuse, New York and visits other areas of New York, Massachusetts, and Connecticut (AxeFest 2015). See below for a full listing of dates, brought to you by Mindsnap Music, Tru Entertainment & promotions, & Hatewear Inc.
*Receive a FREE Hatewear Inc. “For The Headbanger’s” Brutal New Music Vol. # 6 compilation CD with every entry to any of these shows! Immediately following the US dates will be another trip back to the EU for another round of headline shows, some shows with Death Angel, some shows with DeathDealer and more summer festivals including Bang Your Head and Headbanger’s Open Air. a full concert from their latest trip to Greece can be found right here….